Earlier this year Roundy’s grocery stores replaced their Fuel Perks rewards program with the Fresh Perks rewards program. Many consumers were used to and liked the fuel discount program. Grocery store rewards programs are often a coalition with a c-store that gives you a discount on gas (Cathy posted about it here). With the Fresh Perks program Roundy’s stores focused on rewarding their consumers for purchasing at their stores. The rewards program is still pretty new as it debuted in April. The basic program structure is pretty simple. Customers enroll for the rewards program in the store and can use either a card or a phone number to access their account at checkout. Discounts are applied to your groceries when you check out. There is additional coupon options which I have yet to explore and Double Daze that allow you to double a coupon. The Fresh Perks program also includes promotions that run for a set time. 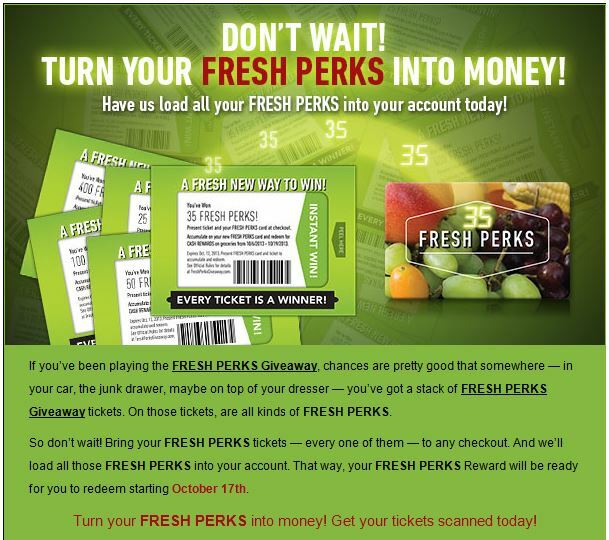 Currently for every $50 you spend until October 9th you receive Fresh Perks giveaway ticket that has a code to enter online for sweepstakes and a point value to earn dollars off. After the promotional time is over you can redeem the points you have earned. As a person who frequents the grocery store but has never cared for the fuel discount rewards programs I was excited to become a member in the program. After using it for a few months here are my initial reactions. The good – The website, in store commercials and reminder emails are all great examples of customer communication about the program. The challenge – Even though I have been a member for a few months I am still unsure of exactly how the coupon side of the program works. All I know is sometimes I don’t get the discounts I think I am supposed to when I checkout. This could be an issue of needing to read more about the coupons, but I want my rewards experience to be easy to use and I just remembered to look into it. The good – Members are incented to get more out of the program by registering to win other sweepstakes prizes online and adding coupons to their rewards card. The challenge - A lot of the power is in the customer’s hands. This can create customers that are more engaged in the rewards program or it can mean a lot of customer’s will not take the extra steps. Entering the Fresh Perks giveaway tickets takes a lot of time and involves tiny paper tickets that I have to not lose in my purse. The good – The rewards program has multiple benefits including manufacturer and store coupons, cash back promotions and various frequency clubs like buy 10 salads get $3 off. By offering so many promotions you have something for everyone. The challenge - For the giveaways you need to spend a lot of money in a short time frame for a small dollar amount off. Even with how frequent I purchase groceries, most times twice a week, I will still only have earned $4 off. The cashback giveaway is based on getting one percent back. Roundy's new Fresh Perks rewards program offers many benefits if you as a member will do a lot of legwork. I am interested to see what my actual earnings are after the cashback giveaway period ends. Depending on the amount I save will depend on how engaged I am in the future, but it has encouraged my participation more than a fuel rewards program ever did. Regardless of how you feel about the new rewards program it is another case study of a business evolving a loyalty program with great examples of the good and bad that all rewards programs encounter. Interested in learning more? Check out our white paper.